Video content on the internet is a lot like bread: Getting it fresh is much better than finding it after it’s gotten all stale and moldy. It’s for this reason that platforms like Meerkat and Periscope have found such success with live video streaming. Now that Facebook has introduced their own version of the concept, we know social video is here to stay. 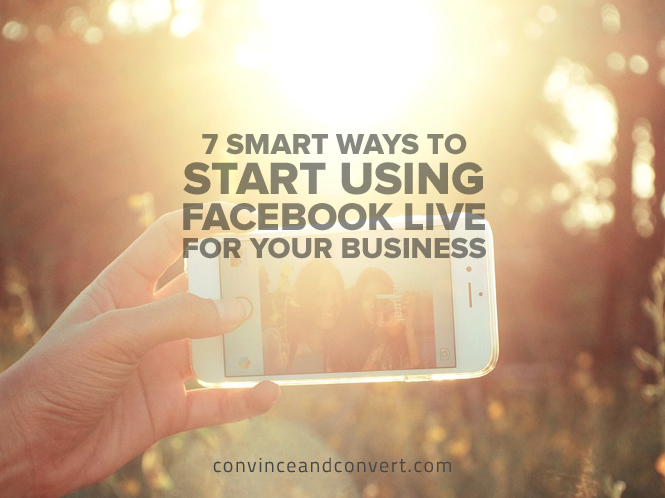 Today, I’m going to introduce you to seven different ways you can start using Facebook Live to create a more engaging and, ultimately, more profitable brand experience for your users. Live video has a certain allure that pre-recorded content cannot match. It turns your video into an experience and an event. Furthermore, it allows your audience to connect with you in real time, and it can all be done with a few button presses. Considering the statistics that show a strong performance from video content, there’s no reason not to join in this revolution. Facebook’s signature simplicity makes this the top live video platform currently available. It holds a lot of potential for your business, so let’s find out how you can tap into that today. Our first strategy works extremely well for businesses with a physical storefront. It’s difficult to convey the look and feel of your store through text or even images, and going through the trouble of producing a video may not give you the results you want. Instead, consider hosting a live event where you give potential shoppers a tour of your store. Start at the front and work your way back, answering questions as they appear in the chat. If you don’t have a physical storefront, no problem. The same effect can be achieved with a demonstration of your product or service in real time. If you want to really go above and beyond, consider taking advantage of the 24-hour capability of Facebook Live. You won’t be able to save a video of this length, but you could set up a live feed of a typical day in your store or office and let viewers see what it’s like to be behind the scenes of your business. Doing this offers huge potential for exposure that your business can use to educate new and existing customers about your brand. In addition, a live video of this magnitude has been proven to appear higher in the Facebook news feed. Online businesses know the power of a well-planned webinar, but they also know the work and time that goes into putting one together. On top of that, many of today’s webinar platforms are complicated, and some are expensive. With Facebook Live, you can organize and run a webinar easily, and you’ll never have to leave the platform. All of your marketing and execution can be done with Facebook’s tools. It makes something as complicated as webinars easier than ever. This also extends to any kind of events you’re hosting or even events you’re attending. Let’s say you have a booth set up at a trade show. You could easily stream the event from your booth and ask people watching to come visit your booth in person. Offer a small incentive, and you’ll have them in no time. Ask your viewers to use the “Invite” button during the event, and use it yourself to bring as many people into the feed as possible. Watch the emojis; they will tell you if you’re audience is engaged or getting bored. Depending on the length of the video, you can save it and share the video on your page later for even more views. Market the event on all of your social media pages prior to the stream. People tend to pay more attention to things like interviews or Q&A sessions if they are happening live. This lends an additional layer of authenticity to the proceedings. In other words, it can’t be scripted. Of course, this also lends itself to possible mistakes or glitches. Take the Buzzfeed interview with President Obama that happened in May of 2016. This was one of the biggest uses of Facebook Live for a live interview. An unfortunate glitch killed the feed, but up until that point, over 35,000 people were watching. That number dropped to half when they were forced to finish the interview on YouTube’s live platform. This isn’t meant to be a dash against Facebook Live, but rather a reminder that anything live can go wrong. It’s important to keep a backup in place. Even so, the amount of viewers on Facebook compared to YouTube shows that there’s more potential for businesses on Facebook. Beyond interviews, you can also use the live video potential to perform Q&A sessions. Facebook’s CEO, Mark Zuckerberg, does these types of streams constantly. During these sessions, he actively encourages people to submit their questions in the comments. He then answers them live. If you ever want to perform a litmus test with your audience and find out what questions they have, this is a great way to bring them into your brand and solicit honest feedback. Information is as valuable as money on the internet. You can provide a huge amount of value by simply teaching your audience something they can use to benefit themselves. Case in point: You can host live online courses. Someone who sells musical instruments can do a series of live courses where they offer tips on how to master various instruments. A designer who sells their own software can host a series of live tutorials on how to best use the program or tool. During these courses, you can promote huge levels of engagement by also answering questions from your viewers and sticking around to discuss any final points before the stream ends. Product launches are extremely exciting, but they are also very exclusive. In many cases, only the press and VIPs are invited to the actual event. In recent years, numerous industries have begun live streaming their events and product launches to give their audience a VIP experience of their own. During this stream, you can and should go all-out with the pomp and circumstance. Show off the new product, what it can do, and how it’s going to revolutionize the lives of your customers. To score some extra points, you can also host a short Q&A session at the end to ask for feedback on the new product and what people thought. Massive events like these can bring huge numbers of people to your brand. A perfect example is how McDonald’s garnered 884,300 people in 40 minutes during their first Facebook Live stream. Recruiting top talent is getting more difficult by the day. Your company’s brand consists of more than just your logo and your overall public appearance. There’s also a deeper, employee-focused element to your brand. In fact, 62 percent of candidates will research a company on social media before they apply. This means they want to see a company that appreciates and values their employees. You obviously do, but you can make it known to the world by giving them some time in the spotlight. Not only does this entice potential employees, but it also allows your brand to showcase its human side and garner more trust from your audience. Each month, choose an employee that you want to spotlight and have them do a live video where they introduce themselves, demonstrate their position at your company, and showcase a normal day in their work life. The same can be done with your business leaders. Make this an ongoing effort, and you’ll find it helps your audience resonate with your brand that much more, while also attracting top talent to your company. Our final strategy elevates your customer service beyond anything other companyies offer. If you have a customer encountering an issue, you can contact them via Facebook Live and speak with them in real time to resolve their issue quickly and with a personal touch. If multiple people raise the same question, you could also have a leader in your business do a live stream where they try to alleviate the issue and ask for feedback from the viewers. This provides customer service to a widespread group of people at once. Facebook Live has brought the concept of live streaming video to the mainstream, and it’s huge for businesses. Use these seven strategies and continue to innovate with your own for maximum results on this amazing platform. How does your business utilize Facebook Live? Let us know in the comments!